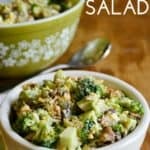 Creamy Broccoli Salad - made with only real food ingredients! I’m not one to usually eat broccoli raw, especially since I struggled with an intolerance to it before going on the GAPS diet a few years ago, but mixed in with other things, I love it! The beginning of something delicious. And how could I say no to those raw pepitas (pumpkin seeds) and organic raisins I had been saving for something special? With these ingredients, there’s not much that could go wrong! Of course, broccoli is full of beneficial nutrients like potassium, calcium, protein and vitamin C, and also known to improve digestion, lower cholesterol, help the body detox and absorb vitamins and minerals, give the immune system a boost, and eliminate inflammation. It’s a pretty impressive veggie! And as for mayo, I don’t go for the store-bought version. It usually full of unnecessary ingredients, but homemade can be a totally different story! I grew up with homemade mayo, and since becoming a mom, I’ve taken my own mother’s recipe, made a few changes, and now I love adding it to salads! 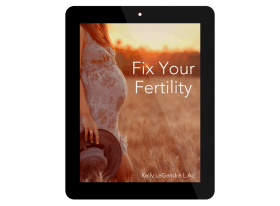 It’s full of healthy fats, free-range eggs, and a touch of apple cider vinegar. Pepitas, or pumpkin seeds, are a good source of magnesium, zinc, and are one of the best sources of plant-based omega-3s. And raisins are also full of potassium and magnesium! Though my husband wasn’t too excited about my rather random ingredient list, after his first bite, he was hooked! I’m pretty sure you’ll be, too. This salad is super easy to throw together and filling enough to stand as a lunch. Made with wholesome ingredients, you'll love how it tastes. Bake bacon at 350 degrees for 20 minutes or until browned and crisp. Let cool and crumble. Throw all ingredients in a large bowl and mix to combine. This is a feel good salad and I would feel good after eating this. Must give it a try. I’m a huge fan of broccoli and this looks like an awesome side. Bet it would pair great with chicken or salmon. 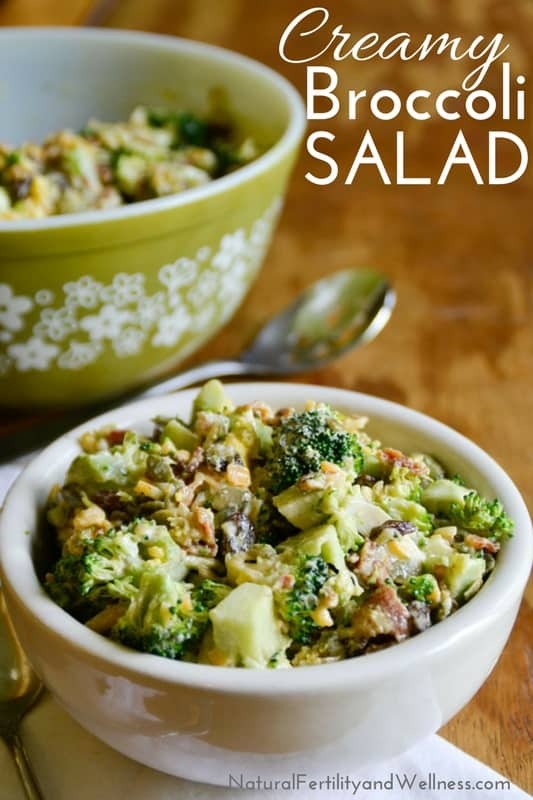 We love broccoli salad and this creamy version sounds delightful! 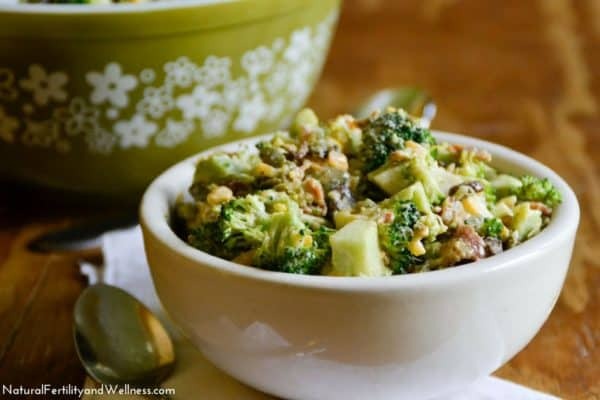 Creamy Broccoli Salad looks amazing, love all the texture and crunch factor you have added here. I see many salads on the net but few compete with your Creamy Broccoli Salad! 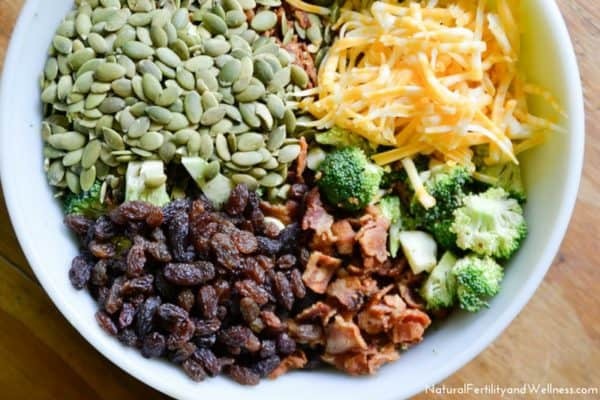 Thank you for sharing such an inspiring salad of epic proportions! Aw, thanks, Heidy. 😉 I love fitting in as much goodness as possible! Texture and flavors rule in this fresh dish! Looking forward to trying. Thanks. !